It is not in the least surprising that the PLO-controlled Palestinian Authority did not condemn the terrorist attack on Sunday. It is not surprising because the PLO-controlled PA encouraged the attack. As Khaled Abu Toameh wrote for the Gatestone Institute, in the aftermath of last month’s US-enabled passage of UN Security Council Resolution 2334, which criminalizes Israel, the PA went on the warpath. Among other things, Muhammad Abu Shtayyeh, who serves as a close adviser to PLO chief and PA leader Mahmoud Abbas called for an intensification of terrorist attacks against Israelis. Shtayyeh said that now is the time to “bolster the popular resistance” against Israel. Sunday’s terrorist murderer probably was inspired by Islamic State, and its adherents’ recent truck ramming murder sprees in Nice and Berlin, as Prime Minister Benjamin Netanyahu said. But Sunday’s 28-year-old cold blooded killer hailed from Jerusalem, not Nice. His brain was washed since he was five years old by the PLO-controlled PA’s steady cycle of jihadist incitement. From the time he was in preschool, the killer was indoctrinated to aspire to commit the mass murder of Jews he carried out on Sunday. For 23 years, Israel and the US have empowered the PLO. During this period, the terrorist group never took any concrete steps to promote peace. At no point in the past generation has a PLO leader ever told the Palestinians or supporters abroad that the time has come to bury the hatchet and accept Israel. Instead, for 23 years, the PLO has openly supported Israel’s annihilation. Often that support has been stated in code words like “popular resistance” which everyone understands means murder. To make it easy for Americans and Israelis to continue funding, arming, training and of course, recognizing the PLO as a “moderate” organization despite its continued sponsorship of terrorism, PLO members are always happy to talk about a “two-state solution” with Westerners that wish to be lied to. But they do not hesitate to threaten anyone who rejects their lies about Jews and Israel. For instance, Abbas reacted to US President-elect Donald Trump’s plan to abide by the US law requiring the State Department to move the US embassy to Jerusalem by threatening him. Trump’s plan will have “serious implications” for the US, Abbas told a group of visiting Israeli leftists. PLO Executive Committee chairman Saeb Erekat said that if Trump moves the US embassy to Israel’s capital, the PLO will lobby Arab states to expel the US ambassadors from their capitals. Jebl Mukaber, the Jerusalem neighborhood where Sunday’s terrorist lived, used to be just an Arab neighborhood in Jerusalem. It wasn’t particularly friendly. But it also wasn’t particularly hostile. But then for about five minutes in 1993, the PLO pretended it wasn’t a terrorist group. To the delight of the US, Israel responded by giving it operational bases in Gaza, Judea and Samaria. The PLO then went about indoctrinating residents of the areas under its control as well as throughout Israel that they must reject all forms of coexistence with Israel and work toward its destruction. These acts of war on the ground have always been complemented by PLO efforts to destroy Israel in the court of world opinion through its unrelenting and ever escalating worldwide political war against the Jewish state. 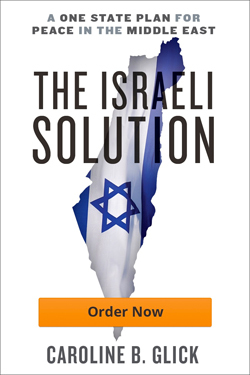 In keeping with this state of affairs, following 2334’s passage, at the same time its members called for intensifying terrorist attacks against Israel, the PLO Executive Committee decided to escalate its international economic boycott campaign against Israel and ratchet up its campaign to convince the International Criminal Court to convict Israelis of imaginary war crimes. Like Sunday’s terrorist attack in Jerusalem, it ought to go without saying that these actions are all acts of war against Israel. The reason it is necessary to state what ought to be the self-evident fact that the PLO is a terrorist organization engaged in a total war against Israel and the Jewish People is because the people that are supposed to act on this reality insist on denying it. The Netanyahu government, the US Congress and US Jewish organizations led by AIPAC still refuse admit the truth about the PLO and draw the necessary conclusions. Those necessary conclusions are similarly self-evident. Israel and the US should cut all ties to the PLO. The PLO should be re-designated as the terrorist group it never stopped being and treated accordingly. Last week, the US House of Representatives passed non-binding Resolution 11, which condemned resolution 2334. Resolution 11 was shepherded through the House by AIPAC, with Prime Minister Netanyahu’s support. The House resolution, which is set to be followed by a nearly identical Senate resolution in the coming days, is based on the proposition that 2334 is bad not because, as the Simon Wiesenthal Center rightly said, it was the worst antisemitic act of 2016. Rather, the congressional resolution rejects 2334 because it harms the chance of Israel and the PLO reaching a negotiated peace that will lead to the establishment of a Palestinian state. Resolution 11 is marginally helpful because it rejects economic and political warfare against Israel. But substantively, in regard to the PLO and its legitimacy, the greatest difference between Resolution 11 and 2334 is that while 2334 embraces the PLO’s anti-Jewish rejection of all Jewish ties to Jerusalem, Judea and Samaria, Resolution 11 recognizes Israel’s right to the Western Wall and the Jewish Quarter. Beyond Jerusalem’s Old City, Congress’s resolution accepts the pro-PLO position that it is a good idea to work toward the forcible expulsion of hundreds of thousands of Jews from their homes in Judea and Samaria to make room for a Jew-free Palestinian state led by PLO terrorists. The problem with this wording is that it ignores the fact that the Knesset is about to pass a law that would effectively cancel that delineation. Similarly, it ignores that the delineation of Israeli communities built since 2000 in Judea and Samaria as illegal was done by a radical Justice Ministry attorney who now heads the post-Zionist New Israel Fund. In other words, Congress’s resolution reflects the view of the far-left fringes of the Israeli political spectrum. Supported by Netanyahu, AIPAC shepherded this resolution through the House, despite harsh opposition from the House Freedom Caucus whose members wish to end US support for the PLO and for a PLO state. Although AIPAC condemned the Obama administration’s refusal to veto 2334, it continues to fervently support the PLO and Palestinian statehood. Indeed, just days after 2334 passed, AIPAC officials and missions were meeting with Erekat and other PLO operatives in Ramallah, as if there is anything pro-Israel about meeting with people who just got the Security Council to resolve that Israel is a criminal state. AIPAC’s continued support for the PLO no doubt stems in part from its desire to keep the Democratic Party inside the pro-Israel tent. Unfortunately, that ship seems to have sailed. Nearly 40% of House Democrats including minority leader Nancy Pelosi and assistant leader Jim Clyburn voted against the PLO state supporting resolution. Rep. Keith Ellison, who is the front-runner to be elected Democratic National Committee chairman later this month, also voted no. Two thirds of the 95 Democrats supported by J Street opposed the resolution. Most of the Democrats that supported Resolution 11 may well have supported it even if it had left out the goal of giving the PLO a state. It cannot be credibly argued that Reps. Elliot Engel and Steny Hoyer would have opposed Resolution 11 if it had simply stated that 2334 was antisemitic. Certainly it is hard to argue they would have opposed it if the vote was delayed until January 21. Indeed, it is hard to understand why it was necessary to pass the resolution while President Barack Obama – who partnered with the PLO to pass 2334 – is still in office. Resolution 2334’s passage must be viewed as an inflection point. It is no longer possible to credibly argue that the PLO is remotely interested in peace with Israel. Sunday’s murderous terrorist attack Jerusalem was further testament of this truth. The time has come for Israelis and Israel’s supporters in the US to demand that our leaders – from Prime Minister Netanyahu to AIPAC to members of Congress – finally recognize and act of this truth. The whitewashing of the PLO must end.